Wow, can you believe it’s been a DECADE since everybody was scared about y2k?! Crazy! I’m still trying to recover from last night. You know, NYE parties. We had quite a party at the Jagmin house. Now I’m not going to go into exact details and risk embarrassing us, but lets just say it involved 3 kids and the stomach flu. TMI? OK? OK.
One of the many projects I am beginning is a 365 photo project. A lot of photographers do these, sometimes with wild themes like photographing a letter of the alphabet every day, to really push their creativity and grow their craft. While I want to also accomplish those goals, it has been my purpose from the start of this blog to document my own family for my children. So that’s what my photo project will be, 365 days of the Jagmin’s. I will have these posts clearly marked with Jagmin 365 in the title so you can easily skip them if you are looking for something far more interesting than the snotty faces, dirty diapers, schoolbooks, and all around insanity that make up our everyday lives. If you do stick around though, first of all thank you, and I’m sorry for what lies ahead. I’ll start this off with a photo of a family member you probably haven’t seen. This is Billy, our brown-eyed, bearded buddy. So this is Matt’s pet goat. 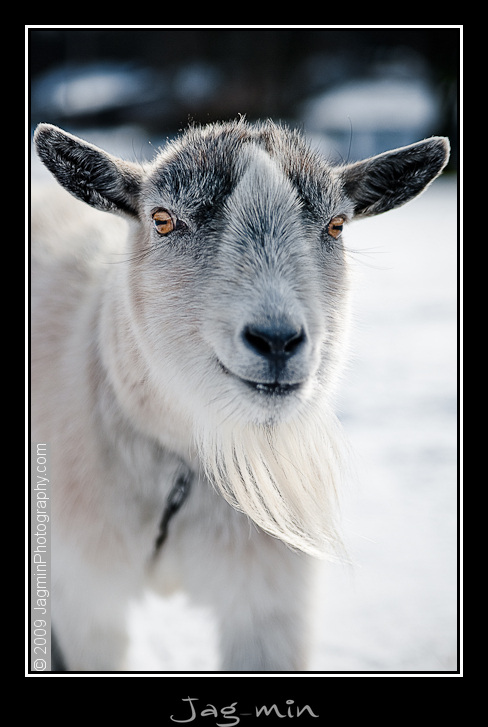 Why a pet goat? I still have no idea. But I did think that he looked particularly nice against this recent snow. Since he behaves rather mean and nasty, I thought I should grab this uncharacteristic “nice” look while it presented itself.